At (63) Áine O'Loughlin was conscious of her age when she first signed up with Complete Fitness, a small personal training studio in Dublin. The part-time property manager thought over-60s fitness was meant to be gentle and low-impact so she was reluctant to listen to trainer, Marc Smith, when he encouraged her to perform push-ups or, worse, lift weights. Three years later and O'Loughlin has a new body and a completely new attitude. She deadlifts, she bench-presses and, according to Smith, she has no trouble performing the same exercises that he gives his thirty- and forty-something clients. "Just because you're older doesn't mean you can't do it," he says. "It just means we have to approach it in a slightly different way." Cardio was once considered the holy grail of over-60s fitness, while aqua aerobics was about as adventurous as it got. In more recent years, however, strength training has emerged as an equally important component of fitness for the over-60s, with study after study underscoring the need for older people to build up muscle mass and bone density through weight-bearing exercise. The latest research comes from a joint team of researchers from DCU and UCD. They investigated a group of over-65s for 12 weeks and concluded that concurrent training - a combination of aerobic and strength work - is the most effective form of exercise for people in that age bracket. Strength training in older adults has also been linked to increased bone density (which reduces the risk of osteoarthritis and osteoporosis), increased mobility and increased life expectancy. And these boons aren't just available to sprightly sixty-somethings: Another study found that strength training after the age of 90 can improve muscle power and balance, and significantly reduce the incidence of falls. It's important to highlight the latter part. The Irish Longitudinal Study on Ageing (TILDA) reports that one third of adults over the age of 60 fall at least once a year, with injuries requiring hospital attention occurring in one fifth of falls. "Many good research studies have shown that strengthening exercise significantly reduce falls," says Professor Rose Anne Kenny, founder and principal investigator of TILDA. "After the age of 50, muscle mass is lost at rates of up to 2pc per year," she adds. "Strengthening exercises will compensate for loss and prevent decline in balance and thus falls." When you examine the evidence - and there's a lot of it - it's easy to understand why older people up and down the country are turning to strength training. Sure, some over-60s are pumping iron for the weight-loss benefits, but the vast majority want to increase their muscle mass and, in turn, live a longer, fuller life. Andrew Dunne, MD and physiotherapist at Personal Health (personalhealth.ie), likens it to a pension plan. "There's going to be way more 65+ year olds in 2030 than there are now," he points out, "and it's an area that probably needs a group of people who aren't going to put further demand on the health system. So preventative care, and fitness for people in the 50+ bracket, is pretty important from a macro point of view. "It's also about complementing their lifestyle, he adds. "People who were in pain are looking to get back to pain-free walking, pain-free golf or whatever it is that they were doing. They currently have to stop that activity due to persistent pain, so it's up to us to put together an exercise session that incorporates strength training and an aerobic capacity without causing exacerbation to underlying joint pain." A big barrier to exercise in the over-60s is the possibility of exercise causing further pain, says Dunne. "So we would measure things like the range of motion in the hips, lower spine and knees. And we would take into account traumatic injury history as well as chronic, which would be deterioration in joint quality over a long period of time - essentially arthritic change. You've got to be aware of loading the joint, and to what degree you do that without causing further inflammation." Strength-training for the over-60s isn't always straightforward, which is why many of them choose one-on-one training in smaller studios over classes in bigger gyms. "The commercial gym is a very intimidating environment, not just for over-60s but for a lot of people," says Jonny Bruton of SMART Training (smarttrainingdublin.com). "These days, there are a lot more personal training-type studios where people are being shown exactly what to do and how to do it - and this set-up appeals more to older people." But not all trainers are created equal, points out David Sisk, a Cork-based personal trainer who has worked with hundreds of clients in their fifties, sixties and seventies (davidsiskfitness.com). "There are so many certifications now and the main ones, quite frankly, are rubbish," he says. "Trainers are taking on older clients - people with joint problems or medical problems - without knowledge of their needs. Then the person gets injured and they never train again." Another bugbear for Sisk is the pervasive myth that 60+ fitness should be gentle and low-impact. "Older people are getting advice along the lines of 'walk for 20 minutes a day'," he says. "But actually, a person at 70 should be exercising five times a week for 30 minutes a day. "I've a 75-year-old coming in at 6am tomorrow. He's doing weights perfectly, and after his session he heads off to work. "We have to remember that older people are so much more capable than society allows them to be." Dr Edward Kelly, founder of The Third Act (thethirdact.ie), agrees. "We're stuck in a mindset about it mostly," he says, "but there is a change happening and it's a very positive thing. "You can see all of these examples now of people in their seventies, eighties and nineties. Just by physically using their muscles consistently, they have the physical bodies of 30- and 40-year-olds. "And without realising it, they are affecting positive change by sending out the message that this is possible." 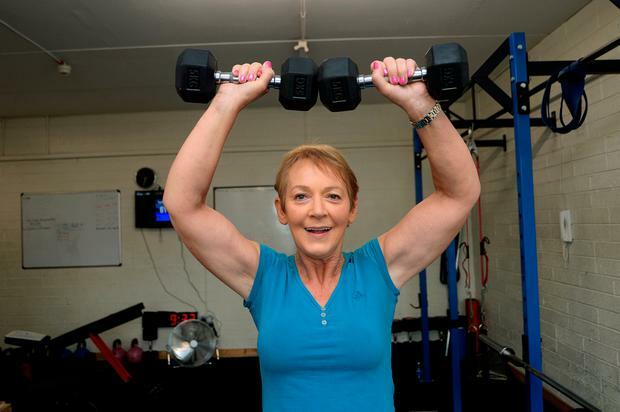 Property manager Áine O'Loughlin (63), (above), has been strength training with personal trainer Marc Smith of Complete Fitness for almost three years. "I lost two stone in anticipation of foot surgery when I was 59. By my 60th birthday, I had lost at least another stone, but then it felt like I had hit a wall. "I felt I needed to do more but I didn't want to find myself in a situation where I had to keep up with 22-year-olds. I don't expect to be able to do that, and the one thing I don't want to do is injure myself in the pursuit of fitness. "I actually read an article in the Independent about Marc and it just seemed to be the right thing at the right time. I needed someone who would push me when it was safe to do things but also say, 'For goodness sake, stop that'. "I had it in my head that I wanted to lose another stone or two and I have done that. What I wasn't expecting was the feel-good factor. That sense of strength - almost a sense of power - and that awareness that we are humans and we live in a human body. I wouldn't have felt that I was abusing my body but I hadn't been kind to it. And I'm amazed by how forgiving my body was when I started to treat it with a bit more care. It's a quality of life issue. When you get older, your hips give out, or your knees give out or you get diabetes and you then can't do what you did beforehand. "In terms of day-to-day, it's about getting down on the ground to pick something up and finding that you're not relying on the furniture to get back up again. "I think there might be another stone in it but Mark is saying forget about the weighing scales. This is about gaining muscle. You will change size and shape but you may not lose weight to the degree that you want to because muscle weighs more than fat. I started strength training with one objective but what keeps me going is the feel-good factor and the respect for my body. I can't guarantee that I'll always be healthy but if I treat my body with respect, it will do its absolute best to support me through whatever happens to come." Do I have to lift weights to increase my muscle mass? * Strength training doesn't always involve free weights or machines. Some people prefer to use their own body weight, either with conventional exercises like push-ups or with apparatus like resistance bands or suspension training straps. * As long as the workout is increasingly challenging, the muscles will rebuild and strengthen. And strong muscles make for strong bones (without strength-bearing exercise, women can lose, on average, about 53pc of their peak bone mass by the age of 80, while men lose about 18pc). * Talk to a health professional before starting a physical activity programme to identify your limits. * Some minor soreness or stiffness is to be expected at first, but pain is a warning sign to stop. * If you have been inactive for years, start with about five to 10 minutes of activity at a time, and increase gradually as you get more comfortable. * Choose activities you enjoy and try to mix your activities. * Chest or upper abdominal pain that may spread to the neck, jaw, upper back, shoulder, and arms (call for help if this should occur as chest pain can be a signal of a heart attack). * Panting or extreme shortness of breath. * Persistent pain, joint discomfort, or muscle cramps. Nurse and cancer survivor, Mary Lennon (above), has been strength training with personal trainer Jonny Bruton of SMART Training Gym for the last two years. She is in her early sixties. "About two years ago I was talking to a nutritionist and I realised that I needed to commit to some regular exercise that would increase my muscle strength. "I was conscious that as you get older you lose a lot of muscle and the body fat increases so I went along to SMART Training Gym in Churchtown, Dublin, and had an interview with Jonny. I thought I'd give it a shot for three months or so. I've been there for two years. "We do strength training - developing the muscles of the upper and lower body - with a little bit of cardio. I use weights, but we started slowly, gradually moving up with an increasingly challenging programme. "My technique is monitored and corrected and I haven't had an injury since I started. Because you lose muscle as you get older, it's really important to counteract that by doing strength training exercise. And you can improve at any age - no matter what your baseline is. "I had cancer some years ago, and I'm aware that as you get older you begin to lose tone and balance, and you start to get curves in your spine. "I've had long-term back issues and I used to have aches and pains a lot. "Now I feel stronger and more energetic and if I miss a session, I start to feel sluggish after a few days. "I wasn't very overweight so that wasn't a major issue for me. But I sleep better now, and my balance and flexibility has increased as well. "My children are grown up and I just need to keep myself as well as possible for as long as possible. More and more older people are becoming aware of the fact that they still have another 30 years or so of living to do so they want to keep as fit and strong as they can. I'm pushing back the years, in a way."